While this is a bit more qualitative than my other posts, I couldn't resist. Further analysis shows another bike ride has been passed off as a run by Rob Young. 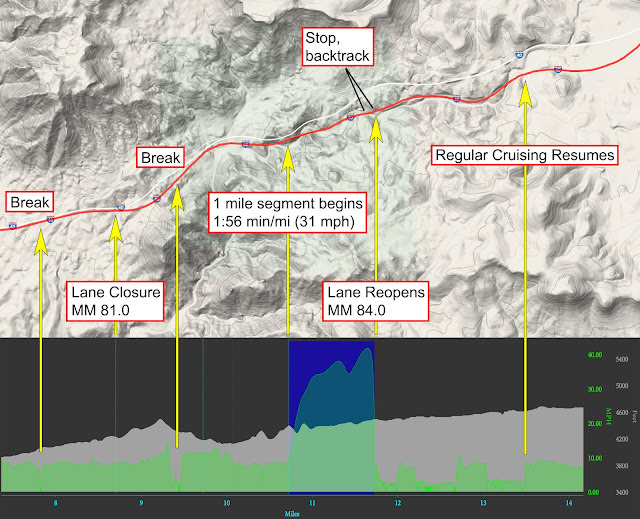 Using a Chrome plugin, I've obtained the raw files for Rob Young's Strava uploads, current as of 6/26/16. 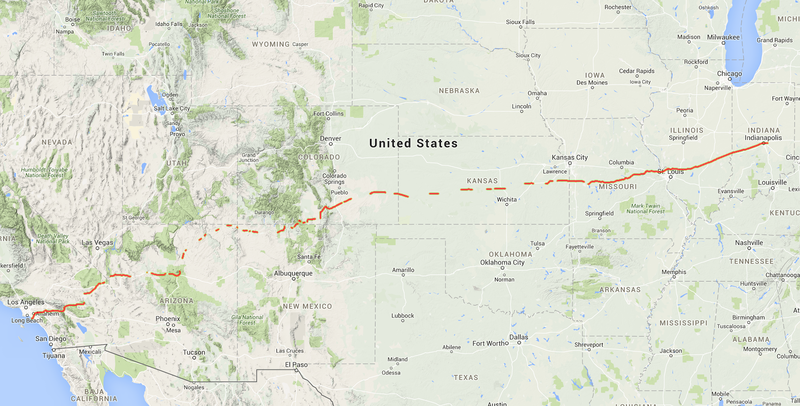 Robert Young is a UK ultrarunner attempting to break the world record for the fastest crossing of the United States on foot. His run has raised much suspicion, especially in the early weeks as he amassed a string of unrealistic daily mileages and paces. Robert's crew is in an RV, in which a live tracker has been recording (albeit with low resolution, one update every 12 minutes when moving). Investigators have archived the tracks here: https://www.google.com/maps/d/viewer?mid=1LT0f678T-ThFL9IhgrtywaDU9Ig. This tracker is always on Eastern Standard Time. 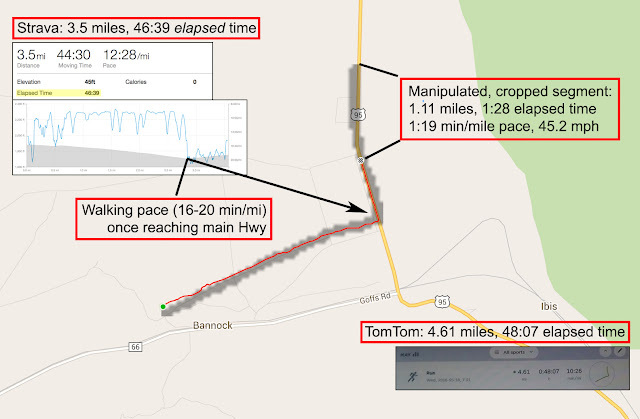 Robert claims to additionally wear GPS watches, and has uploaded evidence of these activities in the form of photographs of a TomTom website to his Facebook page, https://www.facebook.com/marathonmanuk. Here I will utilize available data sources to analyze Robert's movements on May 18. On this morning, Robert's RV became stuck and his travel from that point forward is highly suspicious. A couple of the observations are my own, but this is largely a synthesis of information gleaned from the hard workers over at LetsRun.com. Markus Mueller, team1.kml, 113, and other posters long questioned and analyzed Robert's run and the events of this day. A crowdsourced effort is underway here. Robert Young would have had to travel 34 miles unsupported in less than 4:33. Robert Young would have had to travel 12 miles in no more than 52 minutes. Robert Young hitchhiked 12 miles up Hwy 95.